At all our locations, ski & snowboard rental is an optional extra payable locally in Euros. For Ski Weekender Classic stays at our home base, there’s a well-equipped ski hire suite on-site, and everything is set up for all guests staying here to get fitted on their day of arrival, with no need to pre-book in advance. You can head down to our ski room at your leisure, with a cup of tea, beer or glass of wine; our ski tech works into the night on arrival day so even if you come in on a late flight you can get what you need sorted through to midnight. Ski Hire at the Aravis Lodge literally couldn’t be easier! 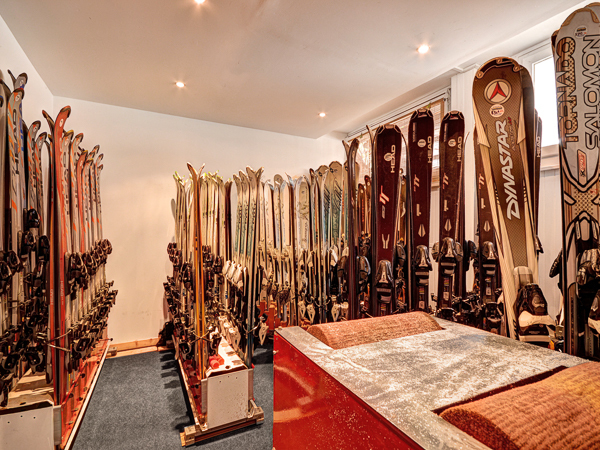 We have a comprehensive, well maintained range of skis, boards, boots, poles and helmets available for all abilities. There is something to suit everyone – from absolute beginners to advanced skiers and snowboarders. The flexibility of ski hire onsite allows you to change, swap or upgrade your gear if desired throughout your holiday, so there is no issue with hiring skis then swapping to a board for a couple of days. Payment is on departure in euros and can be made in cash or by card (Visa/Mastercard). Prices below are confirmed for winter 2018-2019. Questions about Ski Hire at the Aravis Lodge... ?